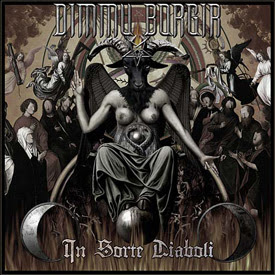 Dimmu Borgir is without doubt one of my favourite black metal bands, and not being very good at keeping up-to-date with when all my favourite bands release something new, I was certainly pleased when I found out that their new album was only 2 weeks away. On release day, I decided to go for the big package (since it was only a few bucks more than the puny, standard edition). A nice little hardcover book in regular CD format, containing the audio CD, a DVD and a booklet with the lyrics... as well as a mirror, to read the lyrics in, since they are reversed.... and upside-down. Nice thinking, but not very practical. The DVD contains the video for the opening track "The serpentine offering" - a fairly well-produced, yet pretty ordinary and predictable story about the evil crusaders coming to christen the peasents. Apart from the video, there's a making of the video, a Dimmu Borgir player, and some various internet stuff I couldn't be bothered with, but I'm sure the really die-hard fans will love it. And it IS commendable when bands and their labels, do something extra with a release. So we're finally down to the core - the actual album. First impression was not as positive as I had hoped for. Maybe I was expecting too much? Maybe I had hoped for something else? - or maybe I should just let nature run it's course, and let the album grow on me. Because it does. Everytime I listen to it. And thats a good thing. Whenever this happens to me, I end up placing it among my absolute top favourites. It's not "Puritanical Euphoric Misanthropia", which is still my favourite Dimmu Borgir album, but it certainly has everything I've come to expect from Dimmu Borgir : blasting riffs, melodic arrangements, ripping drums (although it saddens me a bit that they're no longer played by Reno Kiilerich) and an energy that makes it hard to control various bodily extremeties... which can be a bit of a problem when you're sitting in an office with 7 other people, who do NOT share your musical preference. Tracks like "The chosen legacy" and "The sinister awakening" are my current favourites, but that can easily change. Still - they're probably the most typical Dimmu tracks on this album, in my oppinion, and maybe that's why they're my favourites. I like reckognizable patterns. - Dimmu Borgir knows this.